At the invitation of Foreign Minister Wang Yi, Jean-Yves Le Drian, Minister for Europe and Foreign Affairs of the French Republic will pay an official visit to China from November 24 to November 27. During his visit, Foreign Minister Le Drian will co-chair the 4th meeting of the China-France High-Level People-to-People and Cultural Exchange Mechanism with Vice Premier Liu Yandong of the State Council. France was the first major country in the West to establish diplomatic ties with China. The past 53 years since that have witnessed an overall smooth journey of China-France relations which has been at the forefront of China-Europe and China-West relations. In recent years, the China-France Comprehensive Strategic Partnership has been moving forward in a sound and steady way, and all-around cooperation has yielded fruitful outcomes. Since President Macron took office, the development of China-France relations has maintained a sound momentum. President Xi Jinping and President Macron had their first meeting successfully on the sidelines of the G20 Hamburg Summit, and since then, they have spoken twice over the phone, exchanging views thoroughly on China-France relations and issues of mutual concern and charting the course for the development of China-France relations in the new era. This visit marks Foreign Minister Le Drian's first visit to China and also his first hosting of the China-France High-Level People-to-People and Cultural Exchange Mechanism meeting, which is of great significance to China-France and China-Europe relations. We believe that this visit will play a positive role in enhancing political trust and strategic communication between the two sides, implementing the consensus reached between the two heads of state, coordinating next-stage high-level exchanges and practical cooperation in various fields, and contributing to the development of China-Europe relations. Q: The Victoria's Secret fashion show will be held in Shanghai next week. We have heard that some top models from Russia, Ukraine and the US were denied their visas. Can you explain why? Also, some fashion bloggers didn't get their visas as well. What is your comment? A: I am not aware of the situation you mentioned. We welcome foreign citizens to visit China for normal trade, tourism and cultural activities, and we issue visas to the eligible applicants. Q: It is reported that the UN Security Council failed to adopt two draft resolutions on extending the mandate of the OPCW-UN Joint Investigative Mechanism (JIM) investigating chemical weapons attacks in Syria. What is China's comment? China voted in favor of the draft supported by Russia and abstained in the vote for the draft supported by the US. I wonder what is behind China's decision to do so? Besides, Japan asked the Security Council to renew JIM mandate for 30 days. I wonder if China will support the proposal? A: We regret that the Security Council failed to reach consensus on extending the mandate of JIM. 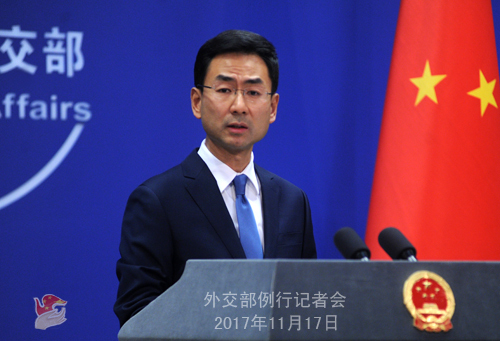 China opposes the use of chemical weapons in any way. we have always maintained that the JIM shall carry out comprehensive, unbiased and objective investigations based on professional measures and solid evidence, so as to draw a conclusion that can stand the test of time. For the solidarity of the Security Council and the integrity of the international non-proliferation regime, China has been working to engage all sides in patient consultation to move towards the same goal. It is a pity however that the relevant draft resolutions were put to vote when there were still disagreements. Deputy Permanent Representative of China to the UN Ambassador Wu Haitao made explanatory remarks after these two draft resolutions were voted. China's position was made quite clear. At present, political settlement of the Syrian issue has reached a crucial stage, with another round of UN Geneva peace talks being scheduled at the end of this month. We do not wish to see the process of political settlement being disturbed by the Syrian chemical weapon issue. We call on relevant parties to adopt a long-term perspective, and make joint and constructive efforts to move forward the process of political settlement of the Syrian issue. Q: The situation in Zimbabwe is the focus of international attention right now. What does China view its development? 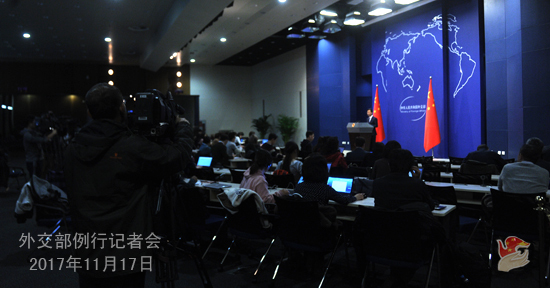 A: With regard to the situation in Zimbabwe, I have made clear China's position at the last two press conferences. The Southern African Development Community has already taken mediation actions. 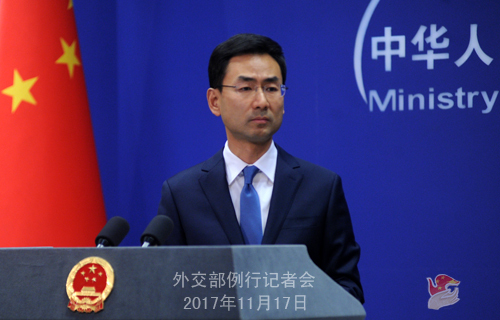 China calls on all relevant sides in Zimbabwe to bear in mind the long-term and fundamental interests of their country, stick to dialogue and consultation to bridge differences, strive for a peaceful and proper settlement of the relevant issue under the legal framework, and safeguard Zimbabwe's national stability and social order. Q: Randall Schriver, nominee to be Assistant Secretary of Defense for Asian and Pacific affairs, in advance policy question during his confirmation hearing at the US Senate Armed Services Committee said both US Navy Ship visits to Taiwan and Taiwan navy ship visits to the US would be entirely consistent with the US one-China policy as they define it. What is your comment? A: We have noted relevant reports. 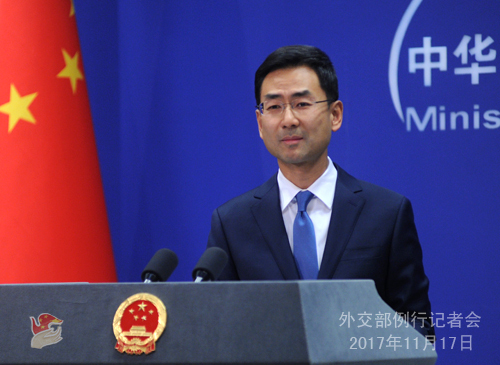 China always firmly opposes all forms of official interactions and military contacts between the US and Taiwan. We urge the US side to abide by its commitment to the one-China policy and the principle of the three China-US Joint Communiqués, stop military contacts with and arms sales to Taiwan, and properly approach Taiwan-related matters with prudence so as to avoid damaging the larger picture of China-US relations and peace and stability across the Taiwan Strait. Q: China calls Mugabe its "old friend". But Mugabe implemented plans to nationalize assets in Zimbabwe. Considering that China has large amounts of investment in Zimbabwe, does China feel worried? A: I gave my answer yesterday. The friendly cooperation between China and Zimbabwe is comprehensive and beneficial to people in the two countries. China's friendly policy towards Zimbabwe is very clear. We are willing to continue developing our friendly cooperation with Zimbabwe in accordance with the principle of equality, mutual benefit, and win-win cooperation. Q: Financial analysts say that the Chinese government indicated its state enterprises to buy in large amounts of equities in lithium mineral companies overseas like in Australia and Argentina so as to ensure the supply of lithium batteries for the production of electric cars in China. Can you confirm and comment on it? A: China is committed to upholding an open strategy for mutual benefit and win-win results and promoting all-around cooperation with other countries in the fields of economy, trade, energy and infrastructure. It should come as no surprise to see cooperation on minerals between China and some countries. As for what you said about buying in large quantities or other specific movement, I have no information. I would refer you to the relevant departments or companies. Q: Cambodia's Supreme Court has disbanded the country's main opposition party. Does China support that move? A: We have stressed many times that China, as Cambodia's good neighbor, good friend, good partner and good brother, has been supporting Cambodia in following a development path that suits its national conditions and the Cambodian government's efforts in safeguarding national security and stability. Q: Did Special Envoy Song Tao leave for North Korea today as announced? Is he going to raise the suspension-for-suspension initiative with the DPRK side? And if he is going to do so, who will he talk to? A: I have taken this question yesterday. Mr. Song Tao, General Secratery Xi Jinping's Special Envoy, is visiting the DPRK to brief on the 19th Party Congress and exchange views on the relations between the two parties and the two countries and other issues of mutual concern. As for his specific schedule, what he will talk about, whom he will talk with, I have no information to share at the moment. As for the suspension-for-suspension initiative, yesterday I made my response comprehensive enough. China's position on the initiative is very clear. We believe it is the most pragmatic, feasible, sensible and reasonable proposal under the current circumstance. Follow-up: will he, on behalf of China, persuade the DPRK to accept the suspense-for suspense initiative? A: we believe, as I have said many times, it is the most pragmatic, feasible, sensible and reasonable proposal under the current circumstance. Q: A lot of attention has been drawn to the resignation of Lebanon Prime Minister Saad Hariri and the ensuing statements made by Lebanese and Saudi Arabian side. What is China's comment? Does China feel worried about the situation in Lebanon and the future development of Lebanon-Saudi Arabia relations? A: We have noted the relevant reports. We hope that relevant parties resolve their dispute through dialogue and consultation, and jointly maintain peace and stability in Lebanon and the region. Q: A question on Foreign Minister Wang Yi's trip to Bangladesh and Myanmar. Will he talk about the Rakhine state crisis during his trip? If yes, what will be China's message on that issue? A: Yesterday I released information on Foreign Minister Wang Yi's attendance at the ASEM FM meeting and visits to Bangladesh and Myanmar. As for you question, I want to say that Bangladesh and Myanmar are all China's friendly neighbors. Foreign Minister Wang Yi will exchange views on bilateral relations and issues of mutual concerns during his two visits. On the Rakhine state issue, China continues encouraging dialogues between Bangladesh and Myanmar so as to find a solution through friendly consultation. Q: In your earlier reply to a question on Zimbabwe crisis, you said China supports a solution within the legal framework. Can we presume that you oppose the regime change and the take-over leaders? And also, it is widely regarded considering the Chinese investments, China has considerable influence in Zimbabwe. Is China playing any role in resolving the crisis along with the African Union? A: As I just said, China calls on all relevant sides in Zimbabwe to stick to dialogue and consultation to bridge differences, and strive for a peaceful and proper settlement of the relevant issue under the legal framework. By legal framework, I mean Zimbabwe's laws and regulations. As for China's influence in Zimbabwe you asked about, like I said, the friendly cooperation between China and Zimbabwe is a comprehensive one. We will stick to our friendly policy towards Zimbabwe and develop our friendly cooperation with it in accordance with the principle of equality, mutual benefit, and win-win cooperation. We hope that national stability and social order be restored in Zimbabwe at an early date. Q: Do you have any update on the talks China is having with Venezuela on the debt issue? A: You asked this question yesterday, and I gave my answer right then. I have no further information to offer. Q: Can you confirm Special Envoy Song Tao is in DPRK right now? A: I have no information for the time being. Q: Is the Chinese Embassy in Zimbabwe playing a role along with South Africa and others to reach a solution in Zimbabwe? A: As far as I know, the Chinese Embassy in Zimbabwe is closely following the situation on the ground and remains in communication with the relevant parties. Meanwhile, the Chinese Embassy has issued safety alerts to local Chinese citizens and companies. I believe it is fulfilling its duties as any China's diplomatic mission overseas would do.